Fits in the BlackHawk Discreet Case Utility Pouch, and attaches with hook & loop. 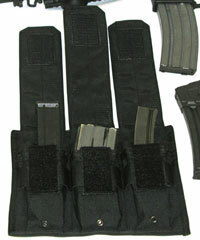 Fits 3-M16 mags, 1 M-14 mag, 2 MP-45 9mm mags, or 1 AK 47 mag in each pouch.  Will also hold radios, handguns, etc.  Lids are full adjustable for height of all mags and other accessories.